With Time Machine, you can back up your entire Mac, including system files, apps, music, photos, emails and documents. When Time Machine is turned on, it automatically backs up your Mac and performs hourly, daily and weekly backups of your files. When you use Time Machine on a computer using Apple File System (APFS), Time Machine not only keeps a copy of everything on your backup disk, it also saves local snapshots of files that have changed on your internal disk, so you can recover previous versions. These local snapshots are saved hourly (unless you unselect Back Up Automatically) and they’re stored on your computer’s internal disk. Note: If you’re using APFS, local snapshots are created on your APFS disk, regardless of whether the disk is on a portable or desktop Mac. 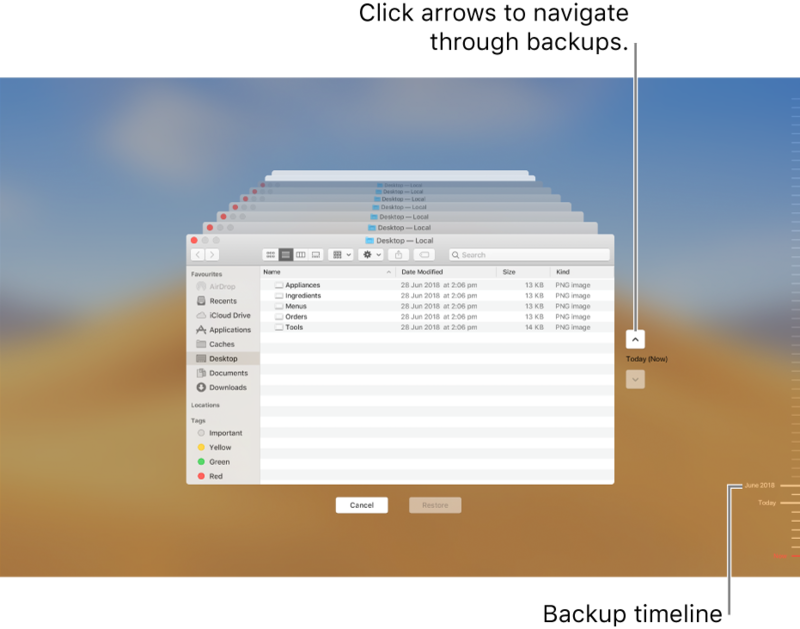 Even though Time Machine creates local snapshots on computers using APFS, you should also back up your files to a location other than your internal disk, such as an external hard disk, a disk on your network, or a Time Capsule. That way, if anything ever happens to your internal disk or to your Mac, you can restore your entire system to another Mac. Connect an external hard disk to your Mac and turn the disk on. You’re asked if you want to use the disk to back up your Mac. On your Mac, click Use As Backup Disk, then follow the instructions in Time Machine preferences. To open Time Machine preferences, choose Apple menu > System Preferences, then click Time Machine.